Seat Height: 16 1/4 in. 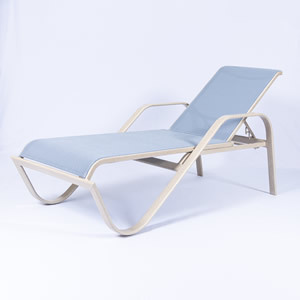 The appealing design and extra wide armrest of the SW165 Wide Arm Sling Chaise Lounge gives this patio chaise lounge unparalleled style and comfort. The wide extruded aluminum tubing is a favorite style among top tier resorts and upscale properties. Choose from a large assortment of powder-coat finishes and sling fabric selections. This premiere chaise stacks easily and is ready to be customized for your property! The SW165 Wide Arm Sling Chaise Lounge stacks for storage and comes with a commercial warranty.